This week's tablehopper: jooked around. May I rest my head upon these potato croquettes? 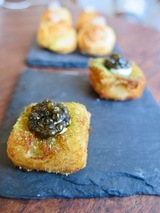 These golden osetra–topped little wonders were made by Nancy Oakes for The Women of Food dinner at Petit Crenn last week. Photo: © tablehopper.com. Hi, peeps. (Did you have plenty of those this past Sunday?) So, I thought I had fully risen from my sick crypt after that nasty flu, but would you believe I got knocked down with some horrific food poisoning just a couple days after I finally left my apartment? WTF! My friend asked if someone put a hex on me. (Was it you? Ha-ha.) I went from a week of binge watching Babylon Berlin to falling back into bed for another three days and bingeing on Wild Wild Country with my curtains down while SF was enjoying that gorgeous heat wave. Shout-out to Coca-Cola and jook. And THC, it’s a miracle worker for nausea. Fortunately, I was able to rally for Easter Sunday lasagna with the fam. It’s my favorite dish evah, and I was willing to put up with some stomach gurgles to have some real food (and the best food!) after two weeks of soup. Finally had my first espresso today, things are getting back on track. She has risen! Again. Hopefully for real this time. I want to say thanks to all of you who participated in our two sponsored giveaways the past two weeks for tickets to SFFILM (San Francisco International Film Festival) and the special preview/salon dinner of the She Bends neon show at The Midway Gallery with Azalina’s this Thursday. I just wanted to urge you to take a look at both events since the ticket giveaways are over, but the events are so very cool and have room for you! I’m really looking forward to having some of Azalina’s rendang chicken while admiring the art of 32 neon artists this Thursday and seeing the film my friend produced this Friday, Hal. Join me? I’m taking extra hugs right now, thanks. One last thing (a teaser! ): I’m going to have some personal (and exciting!) news to share with you next week, thanks as always for reading and your support. Kikuhime Kurogin Shizuku Genshu sake and a broth of toasted grain with burnt onion butter. Photo courtesy of Avery. Opening on Tuesday April 10th is ~AVERY~, marking the transition from Rodney Wages’s ~R.T.B.~, which has been running in the former Mosu space on Fillmore for the past year. This new incarnation has Wages continuing to partner with Matthew Mako (GM)—they were both previously at Atelier Crenn and Saison and are no strangers to luxury ingredients and Zalto glassware. New team members include chef de cuisine Kristina Compton (Plum, Atelier Crenn) and sommelier Daniel Bromberg (True Sake, Dassai Sake, Les Clos). The nightly tasting menu options include the Cello Player ($89), which will include 7-9 courses with optional supplements; Shades of Spring ($189), a seasonally changing 10- to 15-course menu (the name will also change with the seasons); and Avery’s Room ($289), which takes place in Avery’s private dining room (with room for six to eight guests) and showcases a special menu from the kitchen. The modern American cuisine will feature top seasonal ingredients, with East Asian influences. In case you’re wondering about the artistic names, it’s in reference to artist and modern American painter Milton Avery’s oeuvre—and as you are now figuring out, the restaurant was named after him as well. Mixed beverage pairings, with a special focus on Champagnes, beers, and sakes, will be available. Sake lovers will be especially happy with the sake-only menu pairings available, featuring a range of artisanal sakes. The list will have an emphasis on junmai, nama (unpasteurized), and aged options. The space was designed in collaboration with Noz Nozawa of Noz Design. It will now feature some deeper colors inspired by the earth and sea (like charcoal, hunter green, and deep teal), plus materials like dense felts, mohair accents, and brushed brass, along with Italian-designed white Calligaris chairs. There are also custom Venetian plaster wall treatments from local artist Victor Reyes. Some elements will change in the room based on the season; for example, winter will bring tablecloths, while the summer may feature exposed wooden tabletops. Reservations are now live on Tock. Dinner is served Wed-Sun 5:30pm-9:30pm. 1552 Fillmore St. at Geary, 415-817-1187. Cento Osteria will feature plenty of refreshing cocktails. Photo: Nadia Andreini. Housemade pasta will be offered at Cento Osteria. Photo: Nadia Andreini. Some additional details have emerged from Donato Scotti (Donato Restaurant Group), who is opening ~CENTO OSTERIA~ this May in the former Caputo in South Beach (at Brannan and the Embarcadero). This will be his first SF restaurant—he is also behind Donato Enoteca and CRU in Redwood City and Donato & Co. in Berkeley, which he opened in 2017 with Gianluca Guglielmi, who is now executive chef for the Donato Restaurant Group. The menu is going to be osteria style, which will include wood-fired pizza, housemade pasta, and grilled meats and seafood (grilled over live fire! ), with about six items per section. And here’s where you’ll get to do a little taste travel through Italian regions: each item will be associated with a particular Italian city or province. There will also be small plates to pair with wine and cocktails, and housemade salumi and ricotta will be in the mix, plus housemade desserts (one of Guglielmi’s specialties). Wine lovers will be able to choose from 15-20 wines by the glass, with many Italian wines from small-production wineries on the bottle list. There will also be 8-10 cocktails and plenty of grappa and amari to choose from. There’s will be a wraparound patio opening this summer, so start envisioning yourself out there with a spritz for apericena (Italian-style predinner appetizers) beginning at 3pm. The spacious restaurant, outfitted with dark wood accents, will have room for up to 110 diners, including 30 in the bar area. Lunch will come this spring after the early May opening. And here’s another thing to note: I’m going to be hosting a tablehopper preopening event on Thursday May 3rd—details in tablehopper next week! Get ready to apericena! 100 Brannan St. at Embarcadero. A selection of dishes available at Sunday at the Museum. Photo courtesy of Asian Art Museum. A lineup of boba drinks from Boba Guys. Photo courtesy of Boba Guys. Pandan pancakes at 1608. Yelp photo by Cynthia C.
Opening today (April 3rd) is ~SUNDAY AT THE MUSEUM~, a new café at the Asian Art Museum, with fried chicken master Deuki Hong (Sunday Bird, previously Baekjeong in New York) once again partnering with Andrew Chau and Bin Chen of Boba Guys (they host his Sunday Bird window in the back of their shop on Fillmore). The menu has his classic Korean fried chicken sandwich (it’s sooooo good) and a grilled pork “bunh” mi variation, plus soy-chile-garlic “Sunday” chicken wings, but he’s also stretching his wings (har) to include miso avocado toast on Japanese milk bread, and garlic prawn noodles, plus some vegan and gluten-free options. There will additionally be ice cream by Garden Creamery and pastries by Craftsman and Wolves. Chau and Chen will develop a full bar of handcrafted hot and cold brews, like cold-brewed and espresso-based coffees, as well as classic, Hong Kong, and jasmine milk teas, a green matcha latte, boba teas, and a selection of teas by the pot. They will be expanding the tea service with a sommelier later. Good news: you don’t have to purchase a museum admission ticket to dine at the café. There will also be a rooftop terrace (designed by architect Kulapat Yantrasast) opening in 2019. Open Tue-Sun 10am-4pm. Look for a happy hour with beer and wine and a prix-fixe dinner menu coming soon for upcoming late Thursday evenings, when the museum is open until 9pm. 200 Larkin St. at McAllister. More ~BOBA GUYS~ news: they have soft-opened a location on Divisadero, in the ground floor space under Che Fico. Eater reports they will be open this week from Wed-Fri (12pm-6pm), serving their quality boba tea (and other tea drinks). Furniture is coming soon too. 838 Divisadero St. at McAllister. Matcha lovers, now open in Japantown is ~MATCHA CAFÉ MAIKO~ from Honolulu, serving matcha green tea soft-serve, matcha shaved ice, parfaits, and more (via Hoodline). The popular matcha dessert spot is open (for now) Sun and Tue-Thu 12:30pm-8:30pm and Fri-Sat 12:30pm-9:30pm, closed Mon. Updates here. 1581 Webster St. Ste. 175, at Post, 415-757-0919. The new taker for the former Red Door Cafe in Pac Heights has soft-opened, ~1608 BISTRO~, from the owner of the Filipino AJ’s BBQ & Cafe (Kevin Guevarra), with chef Jenem Martin. They are serving brunch on the weekends for now, with dishes like pandan pancakes and braised beef arroz caldo, plus ube French toast apple fritters, with a side of ’90s R&B. Nice. Hours for now are Sat-Sun 10am-2pm. 1608 Bush St. at Franklin, 415-346-1608. It’s time for a coffee klatch: Klatch Roasting is coming to SF. Photo via Facebook. 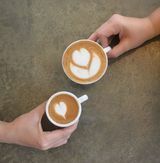 You fellow fans of all things caffeinated will have some new options to get your buzz on, starting with the opening of a location of SoCal’s ~KLATCH COFFEE~ in SF’s Mission. Owner Mike Perry sources coffee from around the world, and their accolades include an award-winning espresso at the Golden Bean Awards (three years in a row! ), and their cold brew won first place at America’s Best Cold Brew Competition. The space (designed by Retail Element Consulting) will feature white subway tile, white marble countertops, and rustic reclaimed wooden tables and chairs, with room for 28. Café fare and local baked goods will also be available. The 25-year-old roastery (well, this fall!) will be opening a second SF location as well. 2567 Mission St. at 22nd St.
Local roaster and café honcho John Quintos (the recently opened Café Lambretta, Cento, Vega) is going to be opening ~CENTO COFFEE, INC.~, in the former Fora Think Space in North Beach. Hoodline reports he’s partnering with Alex Roberts (a partner in Oakland’s Roast Co.), and will be opening a café in addition to offering a retail component for nearby businesses. (Quintos is quoted: “Our focus will be to provide direct service and maintenance to small office kitchenettes and managers.”) Look for an opening in May. 150 Broadway at Battery. The Green Queen, a matcha mint lemonade with hemp-derived CBD honey at Steap. Photo: John Korkidis. A few fun things to go with our sunny, springlike weather. First, ~STEAP TEA BAR~ is collaborating with HoneyPot Hemp CBD on a new beverage, The Green Queen, a matcha mint lemonade sweetened with 10mg of hemp-derived CBD. (You won’t feel any psychotropic effects—although it may help you feel more relaxed if your boss is stressing you out, you’re hungover, or you just finished a tough workout.) You can also add HoneyPot Hemp CBD as a “wellness shot” in any of the drinks on their menu. The drink is $8 and the shot is $2. 827 Sacramento St. at Grant. Great news, the Mission Community Market returns on Thursday April 5th (4pm-8pm)! This spring, CUESA has taken over the market operations, and there will be some new sellers joining the market’s longtime vendors. Bring on the tacos de guisado and Yerena Farms strawberries. 22nd Street (between Mission and Valencia) and Bartlett Street. On Sunday April 8th, don’t miss this hands-on Feaster Sunday dinner at ~THE PERENNIAL~ with Yana Gilbuena, of the Salo Series, who will be hosting a Filipino Kamayan-inspired feast in collaboration with Anthony Myint, who will be integrating his Burmese family recipes and Mission Chinese spice blends into the meal. Dinner will be served on banana leaves, at communal tables (no utensils required). Reservations available 6pm-8:30pm (reserve here). They will also be serving the menu on a walk-in basis in the bar. $55 per person (excludes tax, drinks, and gratuity). Coming to Henry’s: dry-aged dairy beef cheeseburger on a Tartine sweet potato bun. Photo: Henry’s at Graduate Berkeley. 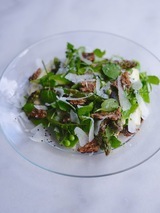 Grilled asparagus and snap peas, fennel, Danish rye, cress, and sheep’s cheese dressing (at Henry’s). Photo: Henry’s at Graduate Berkeley. The iconic UC Berkeley hangout, ~HENRY’S~, located in the former Hotel Durant (recently renovated into the Graduate Berkeley) is getting quite the new culinary team and concept. Chris Kronner (of KronnerBurger fame) is getting some support from Tartine Bakery (Kronner used to be a chef at Bar Tartine) and is also bringing on Jeffrey Hayden (most recently the chef of Del Popolo), Justin Huffman (chef of KronnerBurger), general manager Howie Correa (who is back in California from Gloucester’s Short & Main! ), Julian Cox (currently Tartine’s director of bar operations), and Nicole Rossi, former general manager of KronnerBurger. Considering KronnerBurger remains closed from a recent fire, the team has certainly had time to focus on this new project. 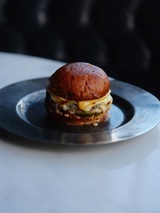 It’s going to be an approachable, contemporary, California tavern—whether you want to meet up for oysters and bar snacks, or of course, one of Kronner’s epic cheeseburgers. The menu will feature top NorCal seasonal ingredients, quality and sustainable purveyors, many vegetarian and vegan preparations, and yes, baked goods from Tartine. There will be plenty of wines (including many that are naturally made), local beers, and cocktails will be rooted in classics while made with new cocktail techniques. Bartender’s Choice will be in effect as well. The space is getting another update by Ashley Hildreth and Luke Foss and will be sporting a clean and warm look with shades of green and charcoal, touches of brass, candlelight, and a redwood bar. The 1920s building has some great details already, which will meld with some modern touches—the airy and light-filled blue Durant dining room will be inviting for dinner and brunch. There’s also a lobby where guests can enjoy a coffee or cocktail. Look for an opening in mid-April (currently set for Thursday April 12th). 2600 Durant Ave. at Bowditch, Berkeley, 510-845-8981. ~MICHEL BISTRO~ is closing on April 14th and will transition into ~BARDO LOUNGE &AMP; SUPPER CLUB~ from owners Seth and Jenni Bregman, who are teaming up with chefs Anthony Salguero and Brian Starkey (Plumed Horse, Sons and Daughters, Commonwealth SF, and Michel). They will be creating a space that is evocative of a 1960s-era dinner party, with a living room-inspired cocktail lounge and upstairs dining room. Lounge menu items like shrimp cocktail, meatloaf sliders, and deviled eggs will be refined, and vintage cocktails served in vintage glassware with old-school hospitality will also be on the menu. Stand by for updates. Another note from Nosh: vegan deli ~THE BUTCHER’S SON~ is moving across the street into the larger Maker’s Common space, which was vacated last month. Look for more seating and an expanded market/retail offering, with grab-and-go items and more. Look for the switch to happen this month. 1954 University Ave. at Milvia, Berkeley. It’s not very often we get access to Dominican food here in the Bay Area, but on Sunday April 8th, ~ALAMAR OAKLAND~ is hosting a special pop-up dinner with guest chef Luigi Pujols. $80 (five courses and includes a cocktail). 100 Grand Ave. at Webster, Oakland. New Bars and More, Coming Soon: Last Rites, Changes at The Alembic, Hotel San Francisco, SF Brewing Co. Girl Scout Cookie Cocktail Week at The Alembic. Photo courtesy of The Alembic. Some quick updates on new bars that are coming soon. First up, Justin Lew and Ian Scalzo, the team behind Horsefeather, are getting closer on opening ~LAST RITES~, their new tropical bar that is taking over the former The Residence. They are taking their inspiration from the pulp literature of Polynesian noir, and with local designer and fabricator Brian Sullivan and interior designer James Lagoc (Nopa, Bi-Rite, Horsefeather), they are re-creating the feeling of being marooned in a tropical jungle, complete with a real airplane fuselage turned into a bar, seating enveloped by enormous banyan tree roots, stacked stone booths in a dense jungle canopy, and nine-foot-tall stone skull idols. There will be more than 150 rums on the back bar, and the menu will feature twists on Polynesian-style cocktails using some local spirits and ingredients. They are currently looking at May for the opening, so stand by. 718 14th St. at Church. Some big news over at the 12-year-old ~THE ALEMBIC~: it ends up it has been sold to Mikha Diaz (Two Sisters Bar and Books) and Christin Evans (Booksmith, The Bindery) and has suddenly closed while they overhaul the concept and space over the next two months. It also means the entire team (including talented chef Rachel Aronow—someone snap her up!) has been let go while they install their own people. Eater reports that will be chef Dylan Barry (Johnston’s Saltbox in San Carlos), bar manager Katheryn Kulczyk (Two Sisters), and Brandon Cardelli (Two Sisters). They are reportedly going to bring the menu back to being more casual and neighborhood-friendly (think sliders and wings), but the classic and seasonal classic cocktail menu format will remain. And…there will be books in the house (when the owners are from the Booksmith and the former Two Sisters Bar and Books, this shouldn’t be a surprise). Some Aussie bar and restaurant owners (behind The Winery, Gazebo, Cargo, and The Stables in Sydney) have taken over the former Mercedes Restaurant in the Financial District (which was squeezed out after decades) and are opening ~HOTEL SAN FRANCISCO~. They will be creating a 75-seat bar with a “glam rock setting,” offering cocktails (including barrel-aged house cocktails served in custom-etched glass bottles), 25 wines by the glass, bar bites (duck confit crostini), and a strong focus on the music (courtesy of Mustard, an Australian music branding company). L.A.-based branding firm The Imagists is behind the design, which will be assuredly Instagram-ready with a palm-leaf mural on the brick back bar by Serge Gay Jr., stools upholstered in pink leather, teal glass tables and velvet chairs with brass frames, tassel chandeliers, and yes, neon. There’s also a basement lounge coming soon. Lunch will also be available, led by chef Keven Wilson (RN74, Perbacco, Volta)—there will be a fried chicken sandwich, grain bowl with seasonal vegetables, and a pork sandwich with cracklings. Opening in April, hours will be Mon-Wed 11am-11pm, Thu-Fri 11am-1am, Sat 4pm-1am, closed Sun. Happy hour Mon-Fri 4pm-6pm. 653 Commercial St. at Kearny. Quick update that ~SAN FRANCISCO BREWING CO.~ is getting ready to open its doors in Ghirardelli Square the last week of April. It’s going to be home of the city’s first self-serve beer wall (the WallTender from Table Tap)—you can use prepaid RFID cards and sample beer by the ounce until you find your perfect pint. There will also be a full bar, pub fare (bacon-wrapped dates, pizzas), and an outdoor beer garden complete with fire pits. It will open for dinner to start, followed by lunch, brunch, and brewery tours shortly thereafter. 3150 Polk St. at Beach. Actor Sam Rockwell (a fellow San Mateo native! )—who is fresh off winning a 2018 Oscar for his work in Three Billboards Outside Ebbing, Missouri—was spotted on Sunday at ~HERITAGE~ in the Inner Richmond, and then again on Monday during lunch at ~TARTINE MANUFACTORY~. Outerlands is seeking a qualified host/reservationist to join our team. We are committed to an exploration of small business as a powerful means to connect personally and creatively with our larger community. Must have comparable service experience, a warm, welcoming demeanor, attention to detail, and strong written/verbal communication skills. Meraki is a one-of-a-kind upscale food store providing the highest-quality products for people with discerning palates. Our chefs prepare daily salads and sandwiches and prepared meals. Looking for someone to assist the general manager and other key management in managing the day-to-day operations of the Market.